Carl Frampton had his second world title fight for his IBF strap when he took on top rated contender Chris Avalos. Avalos had two previous losses in his twenty-seven-fight career, and both had been split decisions versus undefeated opposition. The last of those losses came late in 2011 and since then had amassed a six and zero record with four stoppages. This included good wins over the likes of undefeated Yenifel Vicente and an IBF eliminator against Yautaka Ishimoto. The fight only went five rounds when Frampton ended the event via a TKO and moved his own record to twenty wins, zero losses and zero draws. This kind of performance is what he needs should he be heading into clashes with the likes of Leo Santa Cruz, Scott Quigg and the avoided Guillermo Rigondeaux who all share his division. At this point you have to see Carl Frampton as the number two man at super bantamweight. Leo Santa Cruz and Scott Quigg are also top five, but are not being matched up with the same level of opposition as Frampton at this point. So I would favour Frampton to beat those two guys should they ever meet, but what about Rigondeaux? Honestly, I cannot see anyone beating him, but it would be a great fight. Frampton has a come forward aggressive style which could make him a pretty big name in the future. Right now he has everything he needs in a recognised world title and an undefeated record. Rigondeaux is a very peculiar case. He has proved himself to be one of the best fighters in the world pound for pound, but his risk to reward ratio makes him a highly avoided fighter. Now we are seeing more and more people fighting Gennady Golovkin because his stock has risen to the point where a win over him would do a lot for a fighters career, and soon we may even see the big names like Ward and Cotto in there with him. This isn’t likely to happen for Guillermo however. He doesn’t fight regularly enough, and there aren’t enough good fighters willing to fight him so he is stuck in a lose-lose situation. What I would like to see is the bigger names and better fighters mix it up at this weight class. The matchups that guys like Leo Santa Cruz has been taking are not good enough and ten of those type of wins wouldn’t mean as much as one win in a unification bout with one of the better fighters I have mentioned. I think there is too much at stake for one of these undefeated guys to lose their coveted ‘0’s however and so if anything noteworthy actually happens in this division remains to be seen. 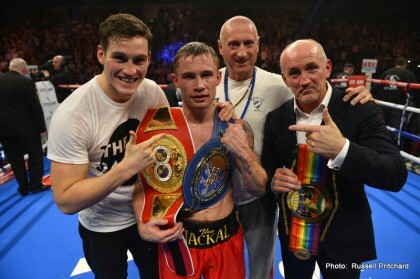 You are here: Home / Boxing Results / How good is Carl Frampton?